I’ve always found that attitude interesting. As a person who was a nerd “before it was cool” I remember getting ridiculed, shamed, and physically attacked for being that kid who liked to read too much. I suppose this kind of reaction could be something similar to how, for example, a Native American would react to seeing a bunch of people suddenly starting to claim (upon Native ancestry becoming “cool”) that they are Native Americans when they look and act totally white, but they had a great-great-great grandparent who was Native. There’s a feeling, I think, that these people never really had the experience of a True Nerd, and that may cause some resentment. There’s a bit of a crucial difference, of course, in that nerdom isn’t anywhere near as easy to determine as race (ironically, since race itself can be a pretty nebulous concept when you look at it close enough), so the gate keeping, especially when they focus so much on the accused fake nerd’s gender, is rather inappropriate. There’s a bit of a crucial difference, of course, in that nerdom isn’t anywhere near as easy to determine as race (ironically, since race itself can be a pretty nebulous concept when you look at it close enough), so the gate keeping, especially when they focus so much on the accused fake nerd’s gender, is rather inappropriate. I would have thought that the crucial difference would be the lack of 500 years worth of genocide against nerds, but then I’m just a cray cray social justice warrior or something. It’s funny how you keep mentioning how this is something only perpetuated by men. It’s not. The comments on that six month old article is evident of that. Did you read them? I can see several men and women with the same attitude towards these women in the pictures, with some (both men and women) mentioning how calling into question their “nerdhood” is sexist with both men and women arguing against the notion. How does this become a situation where “bros” are berating women? It doesn’t say whether the article was authored by a man or a woman; are you just assuming? For no discernable reason, you made this an excuse to attack men and to defend the honour of women. How is the fact that both men and women can both be mocked and insulted for their fandom not an acknowledgement that they’re being treated equally in that respect? How does it morph into women being hysterical and needing a man in their life? I don’t really get your reasoning. Unless I’m not really supposed to. Ironically your rationalising of this situation to become where they ARE being treated unequally COULD ACTUALLY be seen as vying for special treatment, but I’ve given up on trying to decipher radical feminist thinking. I mean, obviously trying to teach them about cultural appropriation and oppression isn’t going to work, but satire should be a thing that nerds understand. Well maybe they should explain it to me too. Satire is supposed to be funny and I didn’t feel the urge to even smile while watching that. Oh yes. Satire is supposed to be funny. Like those great comedic masterpieces Animal Farm by George Orwell and Fahrenheit 451 by Ray Bradbury. Sometimes a pair of glasses is just a pair of glasses. 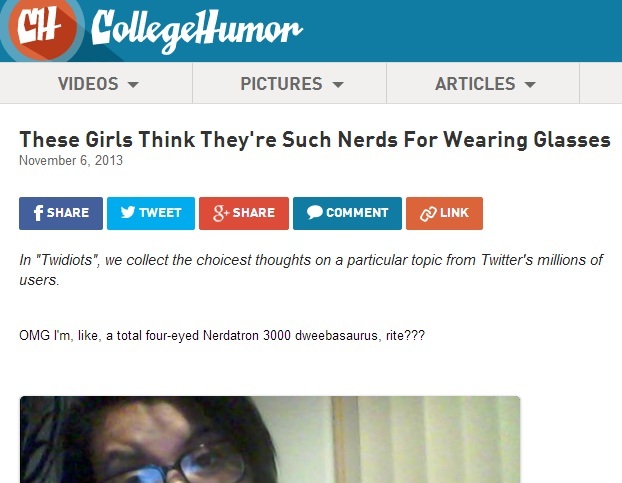 So nerds are exclusively white, middle class, cisgendered, heterosexual and male. I did not know that! Didn’t those used to be called WASPS?